In-home shopping parties bring clothing to you.It’s always more fun to go shopping with a friend than by yourself. You need a friend to tell you if those jeans make your bottom look to big, or to convince you that designer bag is definitely worth a week’s salary. Somehow when you shop by yourself shopping seems more like a chore, but when you’re with a friend shopping becomes entertainment. And if shopping with one friend is an improvement think how much fun shopping with a bunch of friends could be. Why, it would practically be like a party...a shopping party! Not quite a new trend (anyone remember Tupperware parties? ), but as more and more sellers are looking for unique ways to bring their products to their customers, shopping parties are definitely on the rise. Right here in San Clemente we have some entrepreneurs who are perfecting the art of turning the chore of shopping into a real party . Take Emily Schoenig from Emily’s Boutique. In less time than it takes to drive to the mall Emily can turn your living room into a full-fledged boutique, replete with jeans, gorgeous tops and stylish dresses. All you have to add is a room full of neighbors and friends and the party is complete. Emily even supplies the wine! What store in the mall can boast of that? Katie’s in-home parties are for everyone with a taste for vintage. Emily is also proud of her accessory line, especially the interchangeable belts she offers, which really help transform individual pieces into “outfits”. Instead of the impersonal service often associated with the chain stores in the mall, Emily acts as a personal fashion consultant at her parties, helping people find the best fit and the best look for them. Of course with a room full of your closest friends you might not even need her advice … you’ll have a whole room full of people to assure you you’re bottom doesn’t look too big in the jeans! There may be some people out there who just don’t have a living room big enough for a full boutique and all of their friends. In that case, feel free to use Emily’s! Actually her boutique is designed for comfort and feels an awful lot like the living room in someone’s home. You can reserve the boutique and treat it just like you would a party in your home. Once again Emily will supply the invitations and the wine and at the end of the night, you won’t have to clean up a thing! And if baby-sitting becomes a problem she says to bring the kids along. She has a closet full of videos and toys to keep them busy and she welcomes kids in her store at all times. One of the lucky ones, Emily’s found a way to bring fashion and friends together, and she’s enjoying every minute of it! To book a party with Emily call her at (949) 547-0463. For Capo Beach resident Kathy Wilson a desire to furnish her living room in vintage Hawaiian decor, led to a whole new career. What started out as an eBay search for hula girl lamps opened up a whole new world of on-line buying and selling, and Kathy found a talent she didn’t even knew she had! Shortly after making some eBay purchases for her living room Kathy inherited some antique jewelry from her great aunt. Not sure what to do with the pieces, she did some research into their value and then placed them for sale on eBay. To her surprise they earned a pretty penny, and voila, a new career was born. Kathy realized that she had a real eye for recognizing items of value and interest. She began buying and selling vintage items both online and in person. Today Kathy spends up to forty hours a week shopping garage and estate sales for vintage items, focusing mostly on jewelry, researching their value and reselling them. Most of her energy is focused on her on-line business but occasionally, when she feels she has an overabundant supply, she throws open the door to her vintage Hawaiian-themed living room and invites her friends and neighbors over to shop to their hearts delight. My own recent purchases included some lovely earrings from the 1940s and a darling gold plated picture frame from the early 1920s. Each one of Kathy’s items are unique and reflect her talent at finding things that may have once been discarded as “junk” but on further examination reveal themselves to be quite beautiful and valuable. 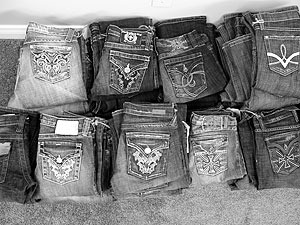 The perfect fit.... trying on jeans at home! Kathy can be reached at 922-7650. 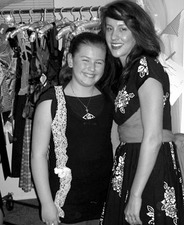 A love of all things vintage, also helped launch the career of clothing designer Katie Lebougeois. As a young girl growing up in La Habra, Katie loved to search the local vintage stores to supply her own wardrobe, and when she couldn’t find just what she wanted she made it herself. After graduating from the design program at Cal State Los Angeles, Katie and her husband decided to make San Clemente their home, and it is here that she continues to design her vintage inspired clothing line called Sophie Pearl (the name she also plans to use for her first baby girl!). Designing out of a cozy apartment on Avenida Victoria, Katie is intent on bringing back the uniqueness and craftsmanship of the garments of the past. Each piece in her line is handmade, using vintage or vintage inspired patterns, materials and notions. Featuring dresses, bustiers, T-shirts, jackets and accessories Katie has something for everyone who desires a little of the old- fashioned in this modern world. Although you can find Katie’s pieces at her on-line store, in select boutiques throughout Orange County, and at the occasional vintage car show, one of the most enjoyable ways to shop her line is during an in-home party. At a recent party guests took turns trying on her magnificent dresses, and making hair clips and designing their own T-shirts embellished with a selection from her vintage materials, laces, buttons and bows. The party was decorated with Katie’s collection of vintage aprons, tablecloths and accessories, giving an air of decades gone by. As guests sipped cocktails and nibbled hors d’oeuvres, Katie circulated, giving design advice and generally being a gracious hostess. Wearing one of her own designs, Katie was the perfect picture of the vintage glamour she hopes to revive. Vintage jewelry is a popular item at Kathy’s parties. If you are a handbag junkie, like me, a “create your own handbag party” with La Nicola may just about be nirvana. LaNicola, the brainchild of Nicola Wellner, is a unique handmade accessories company featuring handbags and baby accessories. I have to admit that anytime I buy a new purse it feels somewhat like a party, but hosting a create your own bag party allows you to share the joy with your friends and loved ones. Nicola brings more than one hundred fabric swatches to your home along with samples of the bags she hand sews. You and your friends can then help each other chose the fabrics and designs that best suit each of you and Nicola will take them home and within a few short weeks a brand new, designed just for you, handbag will arrive on your doorstep. LaNicola features designs and fabrics for every taste and style, and is always adding new fabrics to match the season. And with prices this great you’ll be tempted to design a bag to go with each and every one of your outfits!